The musical mainstream has assigned the Ambient and Soundscape genres to serve as background filler for everyday life. 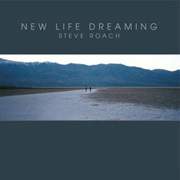 The work of Steve Roach rises above this designation by transforming the Muzak concept into an allegory for the grandeur of creation and the transience of being. His album New Life Dreaming (68'48") is a warm, engaging and personal ascent into synthesizer technology and the soft electronic clouds of sound he produces with it. Five tracks emit a range of moods from the night side of twilight. As strong rolling bass tones surge beneath the slow motion breathing of chordal gestures, resonant melodies hide in huge vaporous spheres of sound. A rhythmic presence on one track leads the listener across a undulating sonic plain, but everywhere else on New Life Dreaming Roach lets us drift. To make this expansive and spacious work Roach must contemplate how to fit together individual elements to form a compelling whole. So goes his craft, while the art of it lies in the composer's ability to transmit his inner condition to the listener. Roach's music relates more to doctrines of technology than those of religion, yet effectively preaches about mankind's place in the cosmos.